LEXINGTON, Ky. (April 5, 2018) – Space Tango, Inc. installed customer research payloads onboard the International Space Station (ISS) on April 5th at 1:00 PM EST after the successful docking of the SpaceX Dragon Commercial Resupply Services-14 (CRS-14) cargo spacecraft. These payloads will autonomously run microgravity experiments until their return to Earth in May. 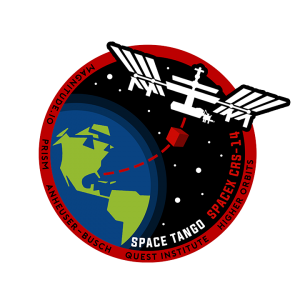 The official Space Tango SpaceX CRS-14 mission patch. NASA astronauts Ricky Arnold and Scott Tingle removed the eight customer research payloads from the docked Dragon module, and installed them in the TangoLab facilities. These facilities will allow Space Tango’s ground station to collect data and images in near real-time while allowing researchers to monitor their payloads’ progress during it’s approximate month-long stay aboard the ISS. The primary purpose of this payload – led by the Princeton International School of Mathematics and Science – is to measure the time dilation effect according to Einstein’s theories. The experiment will illustrate the performance of a nanosecond precise clock design. The secondary payload’s scientific purpose is to determine the mutation rate of isolated plasmid DNA over an extended period of time on the ISS. The DNA sample will be sequenced before and after going to space, and the number of mutations will be compared to a terrestrial control.